Dispensette® Organic Bottletop Dispenser – Replaced by the Dispensette® S Organic ! 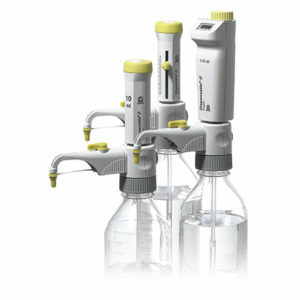 Home>Liquid Handling>Bottletop Dispensers>Dispensette® Organic Bottletop Dispenser – Replaced by the Dispensette® S Organic ! Product and ordering information for the Dispensette Organic bottletop dispenser for accurate and precise dispensing of laboratory chemicals and reagents. The Dispensette® Organic has been replaced by the NEW! updated Dispensette® S Organic. For information on the Dispensette® S Organic click here. To cross-reference a Dispensette® Organic catalog number with the new Dispensette® S Organic catalog number click here. For technical information on the Dispensette® Organic, refer to the operating manual. Spare parts and accessories for the Dispensette® Organic are still available here: Bottletop Dispensers Parts & Accessories. Can the Dispensette® dispense _________? Br (Bromine): Bromine is too dense to be dispensed by a Dispensette®. Carbon Disulfide (CS2): Carbon disulfide presents an explosion risk, and should never be dispensed by a Dispensette®. Suspensions: The Dispensette® should not be used to dispense liquids that contain particles, as they will clog or damage the insides of the instrument. Physical Limitations: Any liquid that has a density of over 2.2 g/cm3 can not be dispensed by the Dispensette® III or Dispensette® Organic, as it will be more dense than the borosilicate glass filling valve, and the ball will float, preventing it from closing. Temperature of 59°F to 104°F (15°C to 40°C) for instrument and reagent. Temperatures of up to 250°F (121°C) will not damage the Dispensette®, although some of the materials may get soft enough to get damaged by use at these temperatures. The major consideration for hot applications is that liquids dispensed at higher temperatures, like agar, usually are done so because the liquid becomes less viscous at these temperatures. When the liquid cools, these type of liquids can clog the Dispensette®. A customer may try these temperatures, but at their own risk, as it will void the warranty. 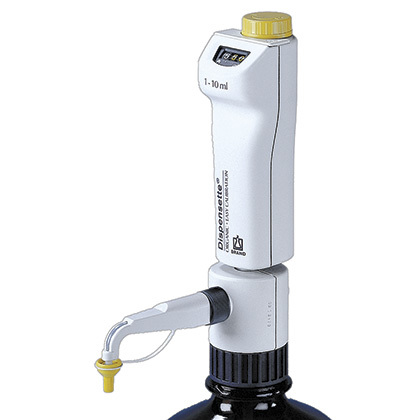 For dispensing agar, we recommend our seripettor® bottletop dispenser. Viscosity over 500 mm²/s. Liquids that are too thick will tend to clog the Dispensette®, impair valve function, piston movement, etc. Vapor pressure over 500 mbar (375 torr) or extremely volatile liquids. Liquids that have a high vapor pressure tend to vaporize inside the dispenser, causing liquid to flow out of the dispenser even when the instrument is not being operated. A common volatile liquid is Acetone (aka "Nail Polish Remover") which has a vapor pressure of 184 mbar at room temperature, and will work fine. Diethyl ether has a vapor pressure of ~450 mbar at 20°C, so can be dispensed with a Dispensette®, but it would not be recommended if the room temperature was significantly higher. What is the difference between a Dispensette® III and a Dispensette® Organic? The Dispensette® Organic has much in common with a Dispensette® III, however there are two major differences. The Dispensette® Organic has a glass piston, rather than a PFA-coated piston. This optimizes it for use with concentrated acids and organic solvents that can interact with the PFA, but makes it less useful for bases. In addition, the valve spring was changed in the Dispensette® Organic to tantalum (from platinum-iridium alloy) to allow it to be used with peroxides, again, at the expense of compatibility with bases. Because of the different construction and chemical compatibility, parts from a Dispensette® III should not be used with a Dispensette® Organic, and vice versa. How do I clean my Dispensette®? Cleaning instructions are located in the manual. If you do not have a copy, click here for the electronic version. All current Dispensette® models disassemble easily for cleaning. My Dispensette® seems to leak at the base, especially after priming. How do I stop this? It's probable that the recirculation tube was not reinserted into the underside of the instrument. This directs liquid down the side of the bottle, to help keep from generating additional bubbles when priming. When absent, some liquid can dribble down the side of the instrument. If you need a replacement, the part number is 8317 and can be ordered from your favorite supplier. Unfortunately, the piston on a Dispensette® is matched to the cylinder to very close tolerances at the factory. This is so that the instrument can have smooth one-handed operation without the need for a seal. However, this makes piston replacement impossible. If you break either your piston or cylinder, call Customer Service (888.522.2726), and ask about our Exchange Program. The piston of my Dispensette® is moving roughly. What should I do? Crystals have probably gotten between your piston and cylinder, and are grinding away the piston and seal. (If the instrument has been operated in this condition, it is possible that the piston and cylinder are scored. To avoid this happening, the Dispensette® should be cleaned at the first sign of roughness.) Gently remove the piston, and follow the cleaning procedure as described in the manual. Retry the dispenser. The best way to avoid this issue is to clean your Dispensette® at regular intervals. Continued use of the dispenser in this condition can destroy it. The cylinder of my Dispensette® doesn't fill. What is happening? There are several different causes that could keep a Dispensette® cylinder from filling: 1) The discharge tube and/or SafetyPrime™ valve are not fitted properly. Check to ensure they are attached properly, and that the sealing washers are in place. 2) The filling valve is not tight or the filling tube is not pushed in enough. Recheck the connections. 3) The filling valve is dirty. This case can be determined easily because the Dispensette® piston will be difficult to lift, and it gets "sucked back down" when released. Clean the valve. My Dispensette® is drawing up bubbles and liquid? What should I do? Your Dispensette® has an air leak somewhere. Good places to look are at the junction of the filling tube and filling valve. If it does not make a tight seal, trim some of the tube off, and reattach. Check to see if the filling and discharge valves are tight, and the sealing washers are in place. If the Dispensette® was dropped the cylinder may have cracked, or come loose from the valve block (unrepairable). Lastly, is there any liquid in the bottle? It's hard to say definitely without seeing the bottle. Most 1 liter and 1 quart bottles in the United States have a 33mm thread. Most 4 liter or 1 gallon bottles in the US have a 38mm thread, as do many scintillation fluid bottles. 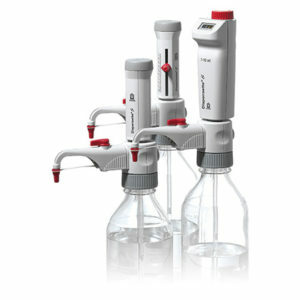 All sizes of the Dispensette® fit 45mm bottles, and come with adapters to fit 33mm and 38mm threads. Smaller Dispensette® dispensers come with additional adapters for smaller bottles. Why doesn't a Dispensette® come with a bottle? 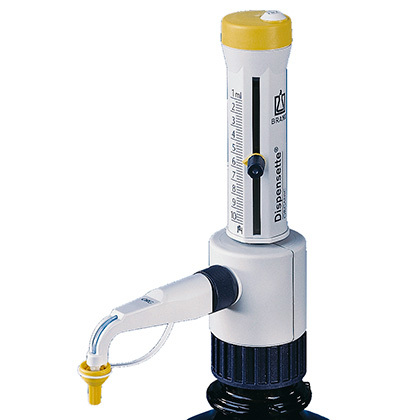 The Dispensette® is designed to fit onto most common reagent bottles with the supplied adapters, and many additional adapters are available. By mounting the instrument directly onto the reagent bottle, poured transfer, and associated spilling, is eliminated. Additionally, the likelihood that we would be able to guess your preferred bottle is extremely small. A performance certificate came with my Dispensette®. Is this the performance for my specific instrument? The Dispensette® is lot tested for accuracy and precision. They are not provided with individual calibration certificates. Can I use my Dispensette® with a bulk chemical container? Probably, as long as it's unpressurized. To mount a Dispensette® Organic directly onto the ¾" bung of a chemical drum, order catalog number 704280. A longer filling tube may be required. Order catalog number 704261 for a Dispensette® Organic to remotely dispense from the drum. For NOWPak containers, use catalog number 704284. As each circumstance is different, additional parts may be required. What is the purpose of the elastomer ring that came with my Dispensette®? The elastomer ring should be installed if the Dispensette® is autoclaved. It should NOT be installed for general purpose dispensing, as it has limited chemical resistance. Complete instructions are in the manual. If you do not have a copy of the manual, click here for the electronic version. Many scintillation fluids precipitate in the presence of water. These precipitates can impair the function of the Dispensette®. You should make sure the instrument is completely dry before use. Additionally, in humid climates, it may be necessary to use a drying tube to keep atmospheric moisture from contaminating your scintillation fluid. Is a discharge tube available with a Luer Lock fitting? A discharge tube with a Luer Lock fitting for the attachment of filters can be ordered as catalog number 707928. This discharge tube is not suitable for peroxides. Care must be taken while dispensing not to create excess back pressure. The SOP for the Dispensette® is available here. Additionally, all of the SOP's for BRAND's liquid handling instruments, as well as the BLAUBRAND volumetric glassware are compiled in EASYCAL™ 4.0 for easy reference. A wide range of parts and accessories are available to even further improve upon the safety, conservation and productivity features of the Dispensette® Organic bottletop dispenser. Discharge Tubes with Safety Valves - Replacement discharge tubes with integral safety valve reduce inadvertent spurting to improve lab safety and conserve reagent. SafetyPrime™ Valves - Help conserve reagent by recirculating samples during priming, and improve safety by reducing inadvertent spurting and dispensing.